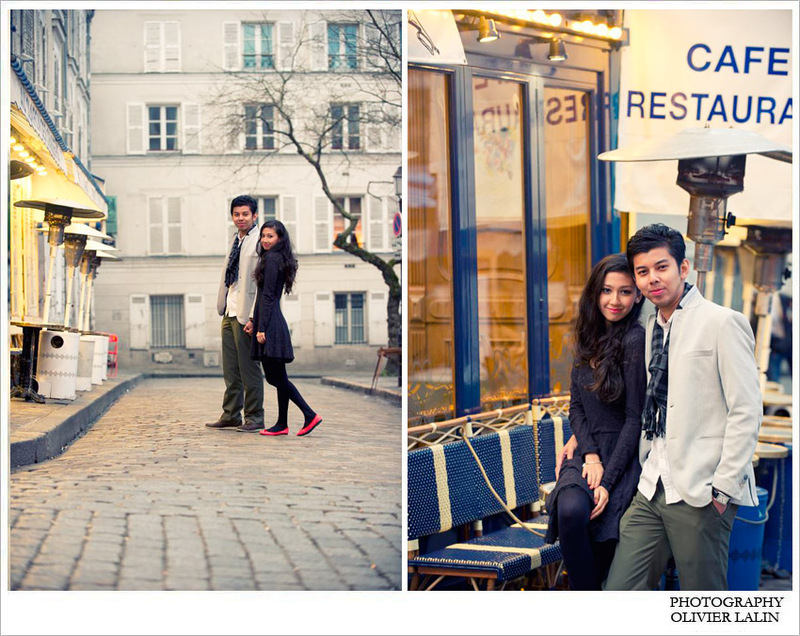 Jihan and Sanjay in Paris for their pre-wedding photo session from early morning in Montmartre to afternoon traveling across Paris. First trip to Paris for the both of them. So much fun and excitements to show this young couple my “little Paris.” More and more we are being contacted for pre-wedding photo shoot, as well as bridal shoot in Paris. We have seen this demand for private portrait growing this past year! What better place to have a photo shoot with your lover then Paris, really! It is a lot of fun to go around the city with a couple in Love and Paris as a background! We have a new package offering a 4 to 5 hours bridal photo shoot which can be split into morning and afternoon to get the good light. That gives us the possibility to drive to Versailles for an afternoon photo session at the castle and its magnificent gardens. We have established a relationship with a few stores in Paris as well that do specialize in renting designer wedding dresses for a day. We would be more then happy to help you find your dream wedding dress for this memorable day in the city of light.